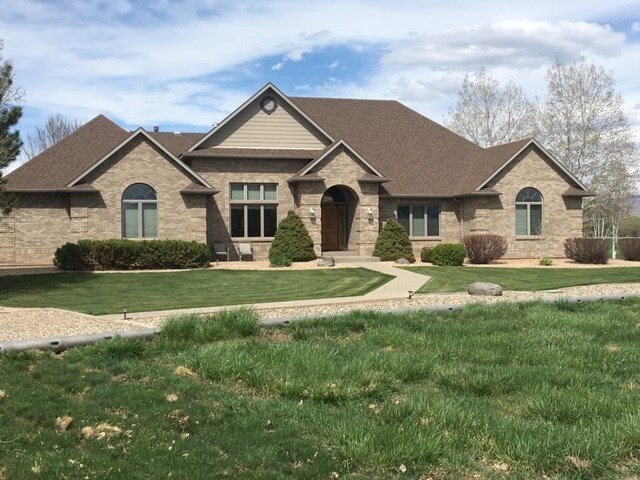 Custom built, one owner, beautiful brick rancher in great location north of Fruita. Two by Six construction, Marvin windows, Vaulted ceilings and much more. This is a first class horse setup with 40 x 40 three stall barn, 150 x 100 arena, 50&apos; round pen and 20 x 16 horse shelter. Sitting on 12 acres. 10 acres of grass pasture and hayfield producing 1200 bales of premium grass hay annually. Included is a 10 x 20 dog enclosure with concrete floor and a large chicken coop. The Barn has a heated bathroom, indoor washbay and tack room. On the west side is an RV hookup. The home has a game room/family room with lots of windows and pool table. The garage is finished and heated with plenty of room for a large pickup. Covered patio faces the Bookcliffs for great views and is shaded from the afternoon sun. Home sits back 1000 feet from N.3 rd. List Broker is coowner and licensed CO RE Broker.